Wingo's Watchtower is the eighteenth course of Captain Toad: Treasure Tracker and the final course of Episode 1. 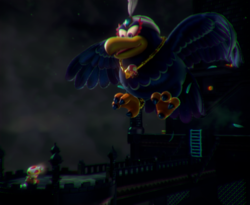 This level takes place on a dark and stormy tower, where Wingo is keeping Toadette. Captain Toad meeting Wingo at the beginning of the course. Captain Toad must climb to the top of the tower while avoiding the strong wind gusts of Wingo. While climbing the tower, Wingo's wind gusts will move some blocks, which can either help or hinder the player's progress. Once Captain Toad reaches the top of the tower, he will fight Wingo using giant Turnips that fall from the sky. After hitting Wingo three times, he will give up Toadette and a Power Star. Super Gem 1: Obtained by plucking the blue handle in the bottom-right corner of the course. Super Gem 2: Halfway up the tower, the player must avoid pulling the blue handle before it, otherwise the path to the Super Gem will be blocked. Super Gem 3: Near the top of the tower. The player must use a nearby ladder (which moves via Wingo's strong wind gusts) to reach it. A hidden 8-bit Luigi can be seen to the left of the HUD while the player is inside the Clear Pipe cannon at the top of the tower.